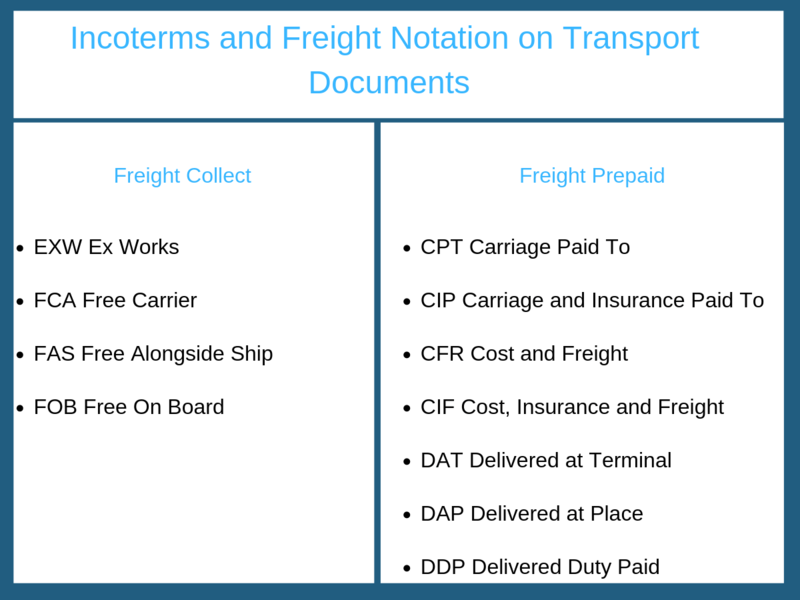 Understanding freight charges and its relationship with incoterms and transport documents. What does freight collect and prepaid mean in international trade. Determining the party who arranges the transportation and pays for the transport cost is one of the major decisions in any international trade transaction. The agreed terms of delivery, also known as incoterms, determine whether freight charges are to be paid by the exporter or the importer. If freight charges are to be paid by the exporter, then this must be indicated on the transport document with a freight notation such as Freight Prepaid. On the other hand, if freight charges are to be paid by the importer, then this must be indicated on the transport document with a freight notation such as Freight Collect. 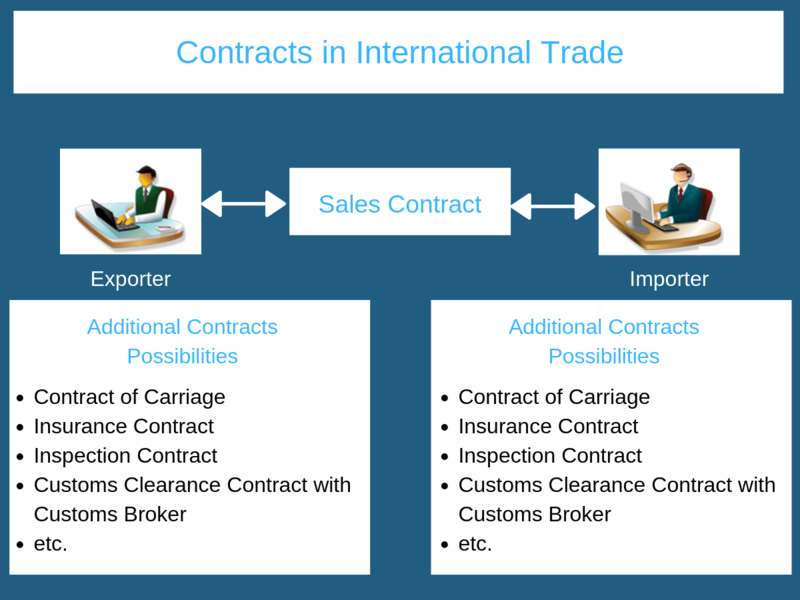 Contract of Sale is the main contract in international trade. It is signed between the exporter and the importer and this contract defines each parties roles and responsibilities. Once the sales contract is signed, the exporter and importer start signing additional contracts with 3rd party service providers to complete the transaction. a contract with customs broker should be signed in order to clear the goods from customs. The contract of sale determines by whom, either the exporter or the importer, the above mentioned additional contracts should be signed. According to the Incoterms 2010 rules, the exporter must conclude the contract of carriage with the carrier and pay for the freight under CFR, CIF, CPT, CIP, DAT, DAP, DDP terms. Freight prepaid is the correct freight notation that should be used on transport documents under CFR, CIF, CPT, CIP, DAT, DAP, DDP trade terms. Incoterms 2010 rules also dictates that under EXW, FCA, FAS and FOB trade terms the importer must arrange the transportation and pay for the freight charges. An exporter from India signed a sales contract with a buyer from United Kingdom for the sales of turmeric. The sales contract states that the payment term is a confirmed letter of credit payable at sight and the transport document is a marine bill of lading. 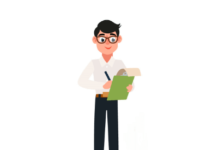 According to the incoterms 2010 rules, under CFR trade terms, the seller must contract or procure a contract for the carriage of the goods from the agreed point of delivery, if any, at the place of delivery to the named port of destination or, if agreed, any point at that port. As a result the freight notation on the marine bill of lading must be “Freight Prepaid“. FULL SET OF ORIGINAL SHIPPING COMPANY SHIPPED ON BOARD MARINE BILL OF LADING TROUGH AN INTERNATIONAL UNIFORM SHIPPING LINES MADE OUT TO THE ORDER OF HSBC BANK, LONDON BRANCH, UK NOTIFY APPLICANT MARKED FREIGHT PREPAID. Bill of lading indicates that “FREIGHT PREPAID”. How to Determine Date of Shipment on a Bill of Lading?